The Complete ‘Pink Five Saga’ is Now Available to Watch Online! The Pink Five Saga is now complete! This award-winning fan film, directed by Trey Stokes and starring Stephen Stanton (Star Wars: The Clone Wars, Star Wars Rebels) and Amy Earhart, has previously appeared on YouTube, Atom Films, iFilm, and StarWars.com. Now, thanks to a successful Kickstarter campaign and the inclusion of a never-before-seen final chapter, the full 59-minute film is available to rent on Vimeo. Prefer to own it? That’s an option, too! 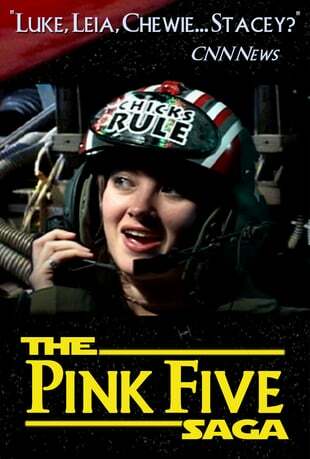 When the original comedy short “Pink Five” won a Grand Prize as Best Fan Film from George Lucas himself, what began as a four-minute spoof grew into an epic video series that took a decade to complete. Along the way, the character of Stacey became a (sort of) canon Star Wars character, appearing on an official Star Wars trading card and even in the Star Wars novel “Allegiance”. Now that the long-awaited final episode is complete, the entire Pink Five Saga is available online for the first time ever! Where can I see the Pink Five videos? Over the years, episodes of the Pink Five saga appeared on iFilm, Atom Film, YouTube and StarWars.com. Now the complete 59-minute Saga – including the never-before-released Final Chapter! – is available online for the low, low rental price of $4.99. For a limited time, use the promo code R5-DD for 50% off your rental! I don’t want to rent the Saga, I want to own it! You got it! We have a limited number of promotional DVDs left over from our Kickstarter project. The DVDs also have the entire Saga, plus loads of special features. To be fair to our original backers we’re offering the leftover DVDs at the same donation level they went for during our Kickstarter campaign.